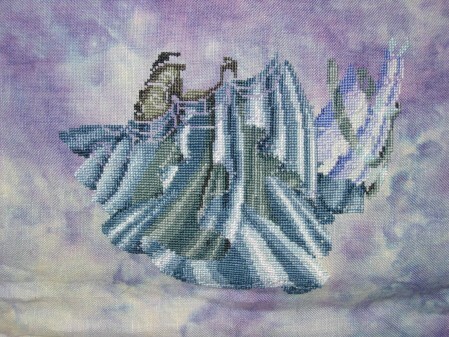 Well this week, I have been having a fantabulous time stitching on Stargazer. I am really reminded how much I enjoy working on Mirabilia pieces. I adore the colors in her dress, particularly the blue-grey in the bustle. I can’t be too far away from the halfway mark on the stitching as she gets a lot narrower as you move up the pattern. The width in the top half is mostly scattered beads. It is a ton of beading though. Here is how she looked the last time I worked on her which was probably back in March. And here she is after this week’s stitching. I do need to put her away for a few days as I have set myself a goal to get Autumn Dragon for my RR done by September 1. On the baby front, he is starting to move around a bit more. He particularly seems to enjoy doing backflips around 11pm. He still gets a bit shy whenever Allen tries to feel him move though. This morning, I went to do a bit more looking around at baby stuff with my mom and sister. I am still totally overwhelmed by everything that we will need. Any suggestions from any moms out there on items you can’t live without or items that are a waste of time are certainly appreciated. After browsing, mom treated Becca and I to massages for our birthdays. It was sooo relaxing, especially after this week at work. I know that back in June I was complaining that I was really looking forward to the end of the school year, but now I really want school to start again. I am tired of being in the admin office all day. I realize that I really dislike the politics and I am much more tolerant of teenage drama than I am of adult drama. « Does anyone remember this piece? It’s been a long time since I had babies (my youngest is 15 years old), however, I do know that a lot of products these days serve multiple purposes. Such as a crib that later can be adjusted to become a toddler bed or a car seat that also triples as a swing and high chair. These items get more use and can be used longer. Happy shopping! Hi there. We bought loads of stuff when we had Riley last year and didn’t use a lot of it. The basics are, car seat (we chose one to last from birth to 4 yrs that stays in the car), pram/pushchair (but be aware that the pram bit will only really be useful for the first 4 months so concentrate more on a comfy pushchair that will be used for years and WILL FIT EASILY into your car boot), cot and sheets (but we bought baby growbags rather than blankets – so much easier to keep a wiggly baby warm at night), a ‘layback’ type chair to put him in when not being cuddled, 6 bottles (max – you wont need this many if you are breastfeeding tho) and steriliser(microwave sterilisers are great! no messing around with sterilising tablets and stuff), big bibs, 2 packs of first size nappies if you’re using disposables, a little bowl for water and cotton wool for bottom changes (you will probably be advised not to use wipes or any baby washing products for the first 6 or more weeks as their skin is too sensitive), bum cream to keep at hand just in case you get any soreness, Vests and babygrows but don’t go buying loads of clothing. They grow out of it so fast in the first months and you’ll enjoy clothing shopping much more when you’ve got baby with you and you know what suits him. The stuff we never used or found totally useless: baby bath (we used the sink for the first two weeks then he went straight into the big bath), swinging crib (he’d wiggle to the side and it’d be on an angle – he hated it), blankets (got no use out of more than one of them with using the growbags), cleaning products and shampoos (we still only use water unless he’s really dirty and he’s nearly one! ), first size bibs (just too small even from day one for big sicky burps and he grew out of them in a month – we are still using his full sized ones tho that we bought when he was 2 weeks old) scratch mits (they would never stay on – a pair of socks on his hands works better), nail clippers (so much easier to bite and peel and lot less stressful if you do it while your other half is giving a bottle to baby so his attention is diverted), Bumbo seat – mm, some people love them, Riley hated it. Don’t bother with highchair just yet. he wont need it until he’s 4-5 months old and can sit up for long periods and it just takes up storage space. I hope some of this has helped. If you want to ask any me anything, feel free to email me. My email address is in the sidebar on my blog – just click on the spinning @mail sign. Super stitching by the way :o) I love Mira’s too. They are so lovely to stitch. PS All that stuff is just my opinion. Some mums love some of the stuff I hated like the baby bath and swinging crib. Nice progress on Stargazer, the fabric is beautiful with the colors in her skirt. Leslie – she is gorgeous!!!!! Your Mira is just gorgeous! The fabric you chose really sets the stitching off. Stargazer is looking great! I love the colors in this! Great progress on Stargazer. Really love that fabric, what is it? Stargazer is beautiful!! The fabric you’re stitching it on just takes it to a whole different level. Stunning!! STARGAZER IS LOOKING GREAT! WHAT FABRIC ARE YOU USING??? BABY STUFF…THE ONLY THING I COULD SAY WAS INDISPENSABLE FOR ME AND HER WAS THOSE LITTLE WASHCLOTHS I BOUGHT 1 PACK AND REALIZED IT WASNT ENOUGH SO I SENT FREDDY TO GET ME ANOTHER TWO…STILL NOT ENOUGH SO I END UP WITH LIKE SIX PACKS AND I LOVE THEM! SHE STILL SPILLS MILK BUT I PUT IT UNDER HER CHIN AND THIS WAY SHE DOESNT GET AS WET. ALSO DONT MUCH OF EVERYTHING, FREDDY AND I SWORE WE WHERE GONNA RUN OUT OF STUFF AND BOUGHT LIKE THREE OF EVERYTHING AND ENDED UP WASTING MOST OF THE STUFF…DO YOU NEED NEWBORN DIAPERS???? I STILL HAVE A PACK NEW WE JUST OPENED IT AND REALIZED OUR CHUNKY BABY DIDNT FIT IN THOSE ANYMORE. I THINK NOW I RECOMEND BUYING CLOTHES AS SHE STARTS GROWING I HAVE TONS OF CLOTHES IN BOXES THAT SHE DIDNT EVEN USE SOME WINTER ONES THAT ARE HE SIZE RIGHT NOW BUT CANT WEAR COZ ITS TO FREAKING HOT. CAN YOU EMAIL ME YOUR ADDRESS ?? Stargazer looks wonderful! You made great progress. 🙂 Have fun with the baby shopping! She is looking beautiful! Great progress! First of all it was great to see a picture of you in your happy pregnant state. Glad to hear you are feeling so good and enjoying your pregnancy. Your Mandela looks fabulous Leslie and I love the progress on Stargazer. Mirabelia does make such lovely designs – I’m stitching my first ever and loving it.